NASSAU, The Bahamas – Members of the Legal Profession led by the Attorney General and Minister of Legal Affairs, Senator the Hon. Carl Bethel and Acting Chief Justice Stephen Isaacs, assembled at Christ Church Cathedral, George Street, Thursday, January 11, 2018 to celebrate the opening of the Legal Year. The service was marked with scripture readings, songs of praise and prayers for those in authority, the courts of justice, law and order and the administration of justice. In his sermon, the Venerable Mark Lindsay-Fox, Rector, Holy Trinity Church, focused on the prayer dedicated to those in authority with particular emphasis on the clause to remove all cause of contention and strife. He said despite an increase in the number of courts, magistrates, and enforcement agents, a nation guided by the wisdom of God’s law is what is required. He said, among the hallmarks of character are integrity, honesty and truthfulness. The Very Rev’d. Patrick Adderley, Dean of the cathedral, officiated. Among those in attendance were the Commissioner of the Royal Bahamas Police Force, Anthony Ferguson, students of C.R. Walker Senior High School and members of the legal profession. Supreme Court Justices Cheryl Grant-Thompson and the Hon. Gregory Hilton also participated in the service. 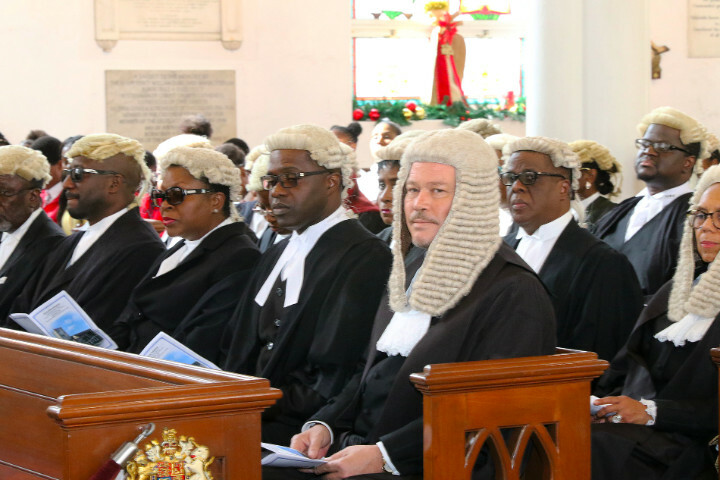 Following the service, members of the legal profession, led by the Royal Bahamas Police Force Band, marched Downtown, Bay Street, to the Supreme Court, Bank Lane and Parliament Street, to attend a ceremony there to mark the opening of the Legal Year.